In March 2003 Seahawk aircraft took off water surface. We participated on this project of German customers by redesigning of wing with horizontal tail and by all aerodynamic, hydrodynamic and strength FEA analysis. 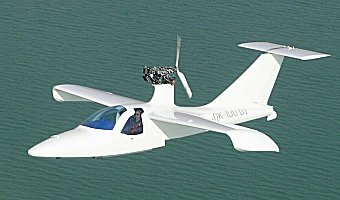 The second prototype S/N X02, manufactured by Schempp-Hirth, výroba letadel, spol. s r. o. company, Chocen, Czech Republic, has been renamed to Seagle, first flight tests were carried out in 2008 and there are performed further tests now also on water surface.